I got home from work last night and dumped my bag in the normal place, the place where it shouldn’t be. My son was loitering about, and there was something on his mind, something that he didn’t seem to want to ask. Yes, that was a good idea, and I’d already decided that we were going to do exactly that anyway, so he didn’t really need to bother being so bashful. The big question was ‘where’? Now, in Bradford, that’s quite a difficult question, because amongst its many charms, Bradford is blessed with a multitude of first-rate Asian restaurants. There’s so much choice that it’s almost embarrassing. We kicked around a few names, and somebody whose opinion I trust very much indeed suggested on twitter that Mumtaz was the only answer, so Mumtaz it was. I haven’t been to Mumtaz, that blinged-out temple to curry up Great Horton Road, for many years, but it’s still exactly the same as I remember it – shiny, showy, marbled, slick and a little bit ostentatious. There’s an enormous photo of the Queen eating there during a visit to Bradford. Really, it’s enormous … billboard sized. Everything is huge. The waiter looked a little taken aback when Ethan ordered a dish of lamb kebab pieces cooked in a rich sauce, pointing out that that particular dish only came in a medium or hot version, not mild. Ethan gave him his best ‘yeah, OK, whatever’ look and ordered it anyway on the basis that a) he was born in Bradford and therefore this sort of stuff is in his genes, and b) he knows that he can take the heat with the best of them, and this is no idle boast because he actually can. We had a couple of starters first, a plate of onion bhajis laced with coriander and spices, and the single best lamb samosa I’ve ever had, a small parcel of shatteringly crisp, almost filo like pastry wrapped around an explosive package of minced lamb. Ethan’s kebab dish arrived, the waiter looking mildly frightened as he put it down. 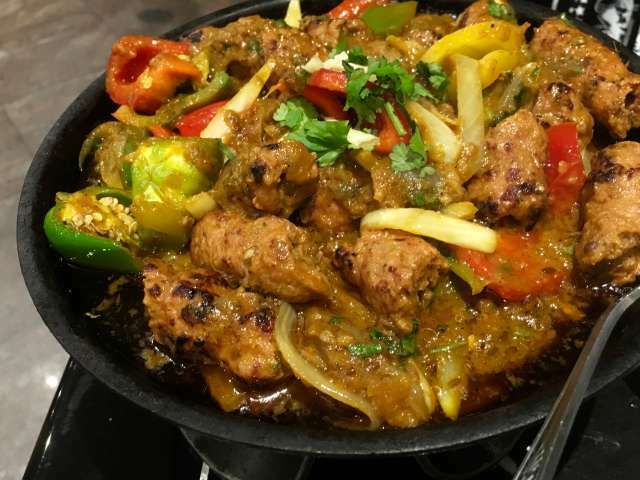 I had a lamb karahi, a sizzling pot of meat still bubbling on a charcoal burner as it arrived at the table. Ethan started to eat, picking up a huge chunk of meat with a piece of naan bread, a slight hush descending over the restaurant. He clocked it, and rolled his eyes in a withering teenage way. We carried on eating, and later, yet another waiter came to check on The Boy’s progress. “You enjoying that, then? Food on point, eh?”, he asked, and we replied that the food was indeed “on point”, some of the best Asian food I’ve had in years, in fact. “That’s good. You eat this at home?”. Yes, we do eat an awful lot of Asian food, and yes, he’s used to the odd chilli. “Sometimes we get people who just can’t hack it, so we get a bit worried”. Clearly, there’d been some sort of waiting staff bet on whether or not this kebab dish was going to blow Ethan’s head off, and he’d won hands down. That kebab dish was delicious – big chunks of high quality minced lamb, grilled on a skewer and then finished in a scant, thick sauce piled with red and green peppers. It had heat, but wasn’t monstrous. It was instead robust and balanced – an excellent Asian dish. Mumtaz sits at the top of the pile of the ‘posh’ end of the Bradford Asian restaurant scene. It’s not particularly cheap (£42 for two starters, two mains, a naan, a couple of really excellent rotis and some drinks), but neither is it ridiculously expensive. There are cheaper places that serve very good food, but Mumtaz has a clear edge, both in the kitchen and the way the place is presented. They’ve got some lovely staff, too, who are genuinely interested in making sure that their diners enjoy their meals, and that alone goes a very long way. So, is Mumtaz the best Asian restaurant in Bradford? I don’t know. It’s all personal taste. There’s The International, Aagrah, Akhbar’s, Shimla Spice, Prashad not so far away … but there’s something indefinable about the Mumtaz blend of excellent food, excellent hospitality and a slight sense of the over-the-top that makes it that little bit special. I was there a couple of weeks ago. A few friends from as far as Durham, Coventry, Manchester have gathered there on an ad hoc basis once a year. We don’t know of anywhere better. Of course, I can remember the Shimla on Great H road, now long gone. I see a link for your review of the Shimla, on Great H road at the bottom of this piece. Is it the same as from forty one years ago? I tried to find it about fifteen years ago, and couldn’t ! Not sure if that’s the same place – this one is past the uni, right on that mini roundabout where you can turn left to go on the road that cuts across the very top of the campus. It’s got an excellent grill there these days. Mini roundabouts hadn’t been invented during my time, the ripper era in fact.